Adam Steele, a 2004 member of the Cadets, sent this picture. My name is Adam Steele, and I marched with the Cadets in 2004. This was at a rest stop in Wyoming. We were on our way to California for the Drum Corps International Tour of Champions that year. 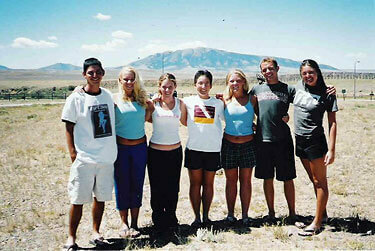 From right to left: are Stephen, Kat, Neely, Sarah, Sandy, me, and then Larissa.